After years of being deferred, the New York City Landmarks Preservation Commission has been in the process of reviewing 95 of its “Backlog” items that have languished on the LPC calendar for more than five years. Although they initially wanted to just remove these items from the calendar, the public pushed back and over a series of four special sessions in late 2015, the LPC heard testimony on each of the backlog sites. 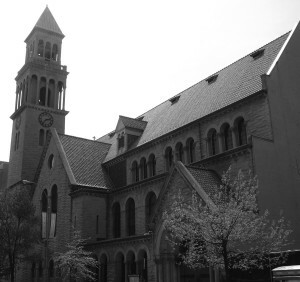 Two of those sites, the 1904 IRT Powerhouse by McKim Mead and White and the St. Michael’s Church building (1890-91), St. Michael’s Parish House (1896-97) and St. Michael’s Rectory (1912-13) which comprise the St. Michael’s Church Complex, all designed by Robert W. Gibson are in the Upper West Side. LANDMARK WEST! has long agreed with these statements and advocated for the preservation of these neighborhood-defining sites on the Upper West Side. In both cases, owners came out to the hearings and advocated against full preservation. In the case of the IRT Powerhouse, current owner, Consolidated Edison requested that the LPC not designated their site but prefers the current state of limbo where they consult the LPC when they want to make changes. For St. Michael’s, Reverend Katherline G. Flexer advocated for designation of the church itself, but not the Parish House nor the Rectory, although all three were designed by the same architect, Robert W. Gibson. Safeguard the city’s historic, aesthetic, and cultural heritage. Help stabilize and improve property values in historic districts. Encourage civic pride in the beauty and accomplishments of the past. Protect and enhance the city’s attractions for tourists. These sites clearly meet the criteria. We hope the LPC steps up to their principles on February 23rd. The LPC will now take action on these, and all 95 properties that were subject of the attempted decalendar. Come to the LPC meeting on Tuesday, February 23rd (time TBA) to witness history. In December of 2014, the LPC panned to “de-calendar” nearly 100 sites across the city, removing them from consideration as potential landmarks and ending the protections that come with that consideration. 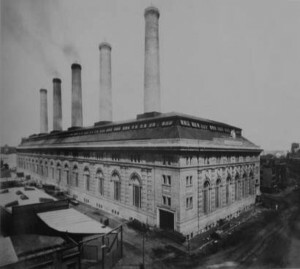 Among the buildings to be removed – without a public hearing – were the UPPER WEST SIDE’s own former IRT POWER HOUSE (see above) and St. Michael’s Episcopal Church (with windows by Louis Comfort Tiffany). Other noteworthy sites on the list include the Pepsi sign in Long Island City, Greenwood Cemetery in Brooklyn, five Broadway theaters and early 19th-Century structures in Staten Island. Strong pushback from the public – people like you! – saved these places. The LPC withdrew its misconceived plan, and the buildings stayed on the calendar. Same wolf, different clothing. Once again, the LPC states that these calendar items would be cleared “without reference to merit.” This is cold comfort if (make that when) developers move swiftly to destroy these places as soon as their protections are removed. Here are a LIST and MAPS of properties that may be lost. Here is a LINK to the Manhattan Borough President Gale Brewer’s Proposed Action Plan. The decisions on February 23rd will be a milestone in a long process which for some of these sites has been under consideration and community efforts for over 20 years. We hope you join us at the LPC, in the Municipal Building, 1 Centre Street, 9th Fl. North for this important meeting. Further details of the Backlog Initiative can be accessed on the LPC website.